In my most recent iherb order (which is quite a while ago...I am in need for another!) 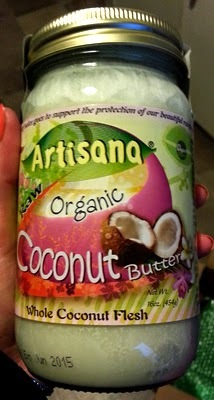 I decided to try coconut butter. I never really liked coconut oil, so thought I might like this better. I love coconut. To be honest, it's not a whole lot different to coconut oil. It does have more of a coconut taste, but the texture is only slightly softer. It is often used as an oil replacement when cooking, and supposedly this butter version is better for spread. It can also be added to smoothies, energy bars and more. My favourite way is to spread it onto crackers or toast and sprinkle cinnamon over top. This raw, organic food is made only from whole coconut flesh. Nutrition: 186 calories, 18g fat (16g saturated), 7g carbs, 5g fibre, 1.9g sugar, 2g protein, 10mg sodium. Obviously high in fat, it is low sugar and has a good amount of fibre. Taste: A mild coconut taste. You can taste it a lot more than coconut oil, so I prefer it. Texture: I wouldn't really describe it as "butter" it's more of a softer version of the oil. You can always warm it up to make it smoother. It melts in your mouth, which is nice. It's just okay. For those looking for an alternative to butter and oil, it will be great for those who love coconut and want that subtle taste added to their food. It's good to have in the cupboard, and I prefer this over coconut oil. But I don't think I will be using it too often. Want to try it out for yourself? You can get your own here, and use my code LDJ484 to get 5-10% off your first iHerb order.